The basic concept behind Safe Routes to School (SRTS) is to increase the number of children who walk or bicycle to school by implementing programs and projects that help to remove the barriers that currently prevent them from doing so. Since the inception of the statewide program, people throughout New Jersey have seen that with its emphasis on active kids, safer streets, and cleaner air, there’s much to like about Safe Routes to School. One of New Jersey’s leading SRTS proponents is Laura Torchio, Professional Planner at The RBA Group and President of Bike and Walk Montclair. As an avid bicyclist, Laura is troubled by the lack of children engaging in active transportation to school today. If you have an interest in the well being of your community, you might wonder where the SRTS program came from, what types of projects it funds, and how you can become involved. The United States Congress enacted the Safe Routes to School program in 2005 in response to growing nation-wide concerns about the health and safety of school-age children. For bike/ped advocates everywhere, the establishment of SRTS became a great opportunity to promote walking and bicycling for the numerous benefits to physical, environmental, and community health. States receive funding through the SRTS program based on student enrollment and are then responsible for administering the funds through self-defined criteria for applicable projects. New Jersey has a long history of dedication to SRTS. In early 2000, before the creation of the federal SRTS program, New Jersey began to investigate ways to implement its own SRTS program. By 2002, the New Jersey Department of Transportation’s (NJDOT) office of Bicycle and Pedestrian Programs, along with a statewide Technical Advisory Committee (TAC), utilized federal funds and on-call consultant resources to develop a statewide program. From this initial phase, NJDOT established a set of goals and targets for a successful statewide SRTS program in NJ. The second phase of New Jersey’s statewide SRTS program began in 2005 when NJDOT began pilot testing the NJ SRTS program framework in three communities – urban, suburban, and rural – to determine the similarities and differences among these three community types. Working with each community, NJDOT developed an Action Plan, including recommendations for all five Es (engineering, enforcement, education, encouragement and evaluation) and techniques for how communities can collaborate with municipalities and schools to make SRTS improvements. Some of the most important outcomes of Phase 2 were the lessons learned from working in each type of community. By the time Congress enacted the national SRTS program in 2005, NJDOT’s early dedication to SRTS allowed the statewide program to hit the ground running. New Jersey officially kicked off its involvement with the federal SRTS program on October 24th, 2006, when NJDOT launched a five-year, $15 million SRTS Program. The federal act requires each state to designate a statewide SRTS Coordinator. NJDOT selected Elise Bremer-Nei, who coordinates SRTS activities from the Office of Bicycle and Pedestrian Programs in Trenton. A variety of projects are eligible for SRTS funding. Both infrastructure and non-infrastructure projects are eligible, as long as the improvements benefit students in grades K – 8. Some examples of infrastructure improvement projects which may be funded through the program include the construction or reconstruction of sidewalks and the installation of new crosswalks, school-zone markings, and speed-limit signs. The funds may also be used for educational and promotional projects such as “Walk to School” days, public outreach, pedestrian safety programs, and bike rodeos. Since New Jersey awarded their first cycle of grants in July 2007, more than $13.5 million in federal-aid SRTS grants have been provided for projects and programs in 84 towns and involving 192 schools. Every county in the state is now home to at least one SRTS project. NJDOT’s Division of Local Aid and Economic Development currently distributes funds for local and regional SRTS projects through a competitive grant process. Applicants for SRTS funds have included not only school districts and municipalities, but also non-profits and counties. 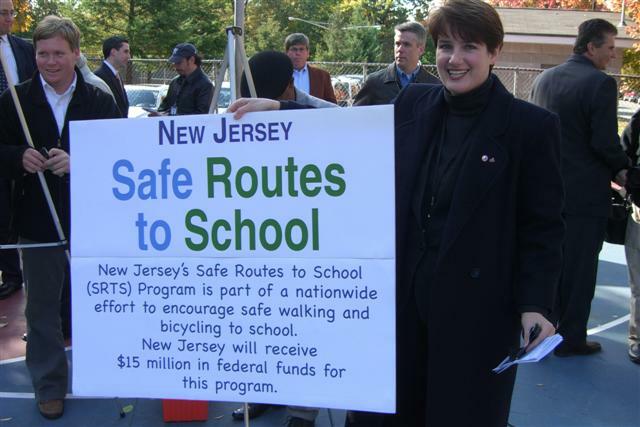 New Jersey’s SRTS program has been celebrated by parents, schools, and local governments as it encourages safe walking and bicycling, promotes exercise through active travel to school, and encourages parents and other motorists to safely share the road with pedestrians and bicyclists. There are plenty of ways to help make Safe Routes to School a success in your community regardless of your local role or occupation. Neighborhood-wide SRTS efforts are most effective when undertaken by a diverse team of community supporters, each with their own distinctive skills and talents. If you are interested in learning more about starting a SRTS program in your community, be sure to visit the NJDOT SRTS website at http://www.state.nj.us/transportation/community/srts/ and check out the NJ SRTS Resource Center at http://policy.rutgers.edu/vtc/srts/. With continued SRTS assistance from the state and federal governments, New Jersey schools and towns can realize the benefits of more walkable, bike-friendly streets.